The bijou Chord Electronics Chordette package surely must be the ultimate, high-class micro system. The set-up can be as simple or as comprehensive as anyone wishes just as with regular separate components, albeit, perhaps, slightly more flexible. Yet it has one distinct advantage: the entire Chordette set-up we tested occupies less space than a single 430mm-wide regular component, and there is a purpose built, modular rack available to accommodate the system and make it look swish. The system under test here comprises the Dual (not pictured), Prime, Mogul and Scamp. Three of these came fitted into the chic £495 Chordette stand for this review, but additional tiers – one per item – are available at £180 each. All components are silver, but can be finished in a range of colours for an extra £50 per item. The £799 Dual is not only an easily configurable phono equaliser/preamplifier, designed to extract excellent performance from a moving coil cartridge, it also features an integral ADC, which will digitise the output of that cartridge so that it can be passed through a USB output to your PC or music server. This connection makes it an extremely convenient unit, even if it does limit the resolution at which you can record to 24-bit/96kHz. We doubt, however, that this will be a cause for concern to the majority of users. The £1,495 Prime preamp has four analogue inputs, while its USB connection allows any USB2- compliant source to attach itself digitally to the unit. A pair of gold-plated analogue phonos, alongside a Chordette control signal and a TOSLINK recording digital output monitor provide the output capabilities. 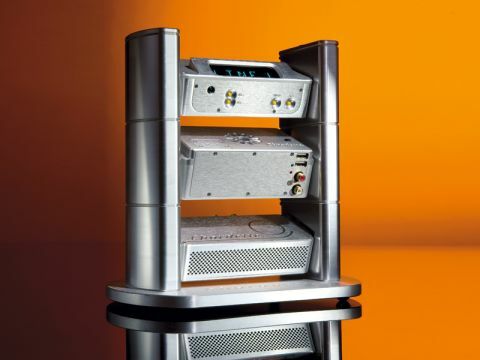 The power amplifier in this system is the £799, 40-watt Scamp. If more power is required, you can add another and bridge both to deliver 80 watts mono per channel. Alongside its conventional phono inputs, the amplifier also provides a USB connection for hooking up a computer or an MP3 player. An adjustable gain control allows for easy switching between low-and high-output level sources. The most expensive component in this system is the £2,195 Mogul, the tiniest – but still the most adequately equipped – multi-media PC we've ever encountered. With its 1.2GHz VIA Nano processor, the Mogul runs the Windows 7 operating system and has 320GB of internal hard-disk storage. It features both wired and wireless networking capability and an eSATA port enables users to attach an optical drive or additional storage. If you need more components connected simultaneously, they can be hooked up through one of the Mogul's six USB 2.0 ports or, if those are all in use, through an inexpensive USB hub, available from any computer store. Be sure to buy a powered hub, if you plan to connect any disk drives to it, though. As well as its audio capabilities, the Mogul provides an HDMI connection for outputting high-definition video – up to 1080p through the unit's VIA VX855 media processor. As the Mogul comes with USB 2.0 port connectivity and each of the new Chordette models has a USB internal DAC – or ADC in the case of the Dual – one can configure a system to use just these ports. For example, you could build a compact desktop computer system using the Mogul, Scamp and a pair of loudspeakers. The Mogul comes with a wireless keyboard and a touch-screen for full operation straight out of its packaging. It also has a USB Wi-Fi adaptor to enable it to talk through the ether with Wi-Fi capable computers in the local network. The system has an admirably solid feel about it, along with an agreeable aesthetic simplicity. The units are internally quite 'busy', as a result of packing all their hi-tech circuitry into such compact casework, but the only external aspect that looks fussy is the wiring mass dangling from the rear of the stack. This mass easily turns into a mess if the cables are not carefully organised and tie-wrapped. The system came with short Atlas interconnects, but we switched these for one-metre MIT cables, so that we could hide some of the wiring bulk behind the equipment table. Some sort of cable management system would be worthwhile here, even though such arrangements rarely do any favours to sound quality. Thinner, more flexible wiring would help, too. The units we tested were very early production/demonstration samples and not 100 per cent up to full retail specification. Chord assured us that the full production-quality units would not suffer the minor hiccups we encountered during testing. For example, we heard a few scratchy sounds through the speakers, when wiggling the USB mouse and we also encountered a degree of latency with it on occasions. You would move the mouse, but the pointer would hesitate for a few milliseconds before responding. However, this, we suspect, might well be a product of the not especially speedy processor, particularly when it is under a heavy load – for example, when making recordings. As an ultra-convenient, compact media player system, the Chordette proves thoroughly rewarding. It sounds not unlike a grown-up, high-end system, delivering bags of detail and drama alongside a healthy dose of rhythmical persuasiveness. Our primary reason for requesting the system was to experiment with it as a means of easily digitising LPs. In this respect, it proved successful, but the measure of that success depended upon several factors. The Mogul seemed a little challenged in the horsepower department: it did not have the muscle to run our Audacity recording software, at 24-bit/96kHz. However, the only other – rather more convoluted – option would be to feed the audio signal from the turntable into a phono-preamp, in order to have a suitably equalized, line-level signal to feed to a dedicated external ADC. The output could then be transferred to a more powerful computer for recording. Playing 24-bit/96kHz tracks from Network Attached Storage – the Chordette system fared well, sounding detailed through NEAT Petite SX loudspeakers. The amplification has an impressive delicacy with jazz, but can also rock aggressively when called upon to do so. This might well be the answer to many people's dreams for a convenient compact LP archiving solution. The Chordette system, configured as a simple phono-stage, pre and power amplifier, is hard to beat and fulfils all its promises. It sounded dynamic, energetic and richly textured when partnered with an Amadeus GTA turntable and Dynavector XX2 cartridge. Use the Mogul as a ripper/player of CD rips and all is fine, too. We just don't feel that's it's sufficiently powerful for the demanding task of 'ripping' vinyl at high-resolution using Audacity software.